I'm a little behind on my blog posts - this one goes back to last Tuesday night. With adjusting to evening classes and homework, it's been hard to keep up! Sorry for the delay, I hope that you enjoy reading the next few posts from the past two weeks. I had been to the Tuesday farmers market and continuing the theme of buying something new to me each time, I picked up some watermelon radishes from Siena Farm. On the train ride home, I noticed that someone had left a bag on the baggage rack. I could read the name Kimball Farm on the bag and figured that someone forgot to take it home (I get off at the last stop). I picked up the bag and inside were 4 fresh ears of corn! I'm sorry to the commuter who had no side dish for dinner, but thank you for adding to ours! 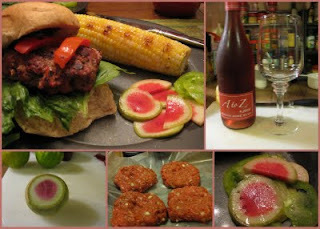 I decided on making a burgers for a late summer (well, early fall) dinner and grilled the corn along with them. I had recently read about a radish salad at one of my new favorite websites, http://www.localinseason.com/ and followed their recipe for the dressing. I paired it with some wine I picked up at one of my other favorite new places, http://www.binendswine.com/. It's a great rose from Oregon - A-Z wines. Perfect for pre-, during, and post-meal sipping! Every time we have burgers I like to add a little twist. The hubby had gone to the store this week and bought whatever veggies looked good. We had red peppers and onions on hand. I mixed up a variation of my meatloaf mixture for the burgers and tossed in a little hoisin sauce for a little Asian flavor. I grilled extra red peppers for a topping and made sure to toast the whole wheat buns on the grill too. This was delicious! Enjoy! Check out the recipe and nice presentation at http://www.localinseason.com/early-fall/37-radish-and-cucumber-salad.html. I didn't have any cucumbers on hands, so I stuck to just radishes. OOH, looks yum. I like the idea of mixing in some hoisin sauce!